here in Dallas, I can't tell you how much I enjoyed it! Authentique papers I got from The Crafty Scrapper in Waxahachie. This is my second project with these papers and I am just loving them! I am so loving that floral pattern- I need more of it! 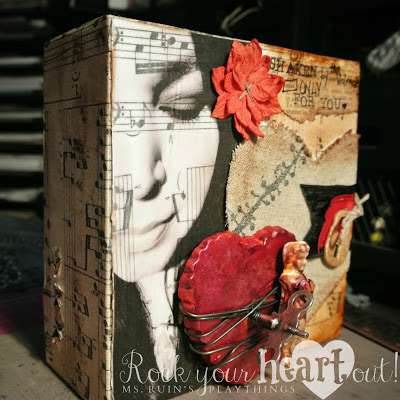 This fabulous piece of chipboard is from Dusty Attic. I painted it with Viva Decor 3-D Stamp paint, highlighted with Viva Gloss Gel pen, and added some sparkle with metallic embossing powder. For my chipboard letters I used white acrylic paint and highlighted the edge with my Rose Metal Gelato® - I think that one is my favorite color! 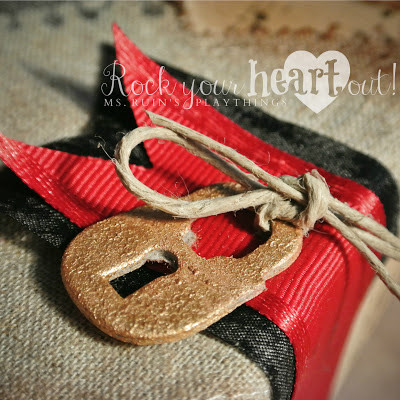 For the heart I used Gelatos® in Rose Metal and Gold. The punch is Martha Stewart, flowers are Maya Road, stick pins are Maya Road and I have gussied them up a bit with crystals and beads, the ribbon is Stampin' Up. 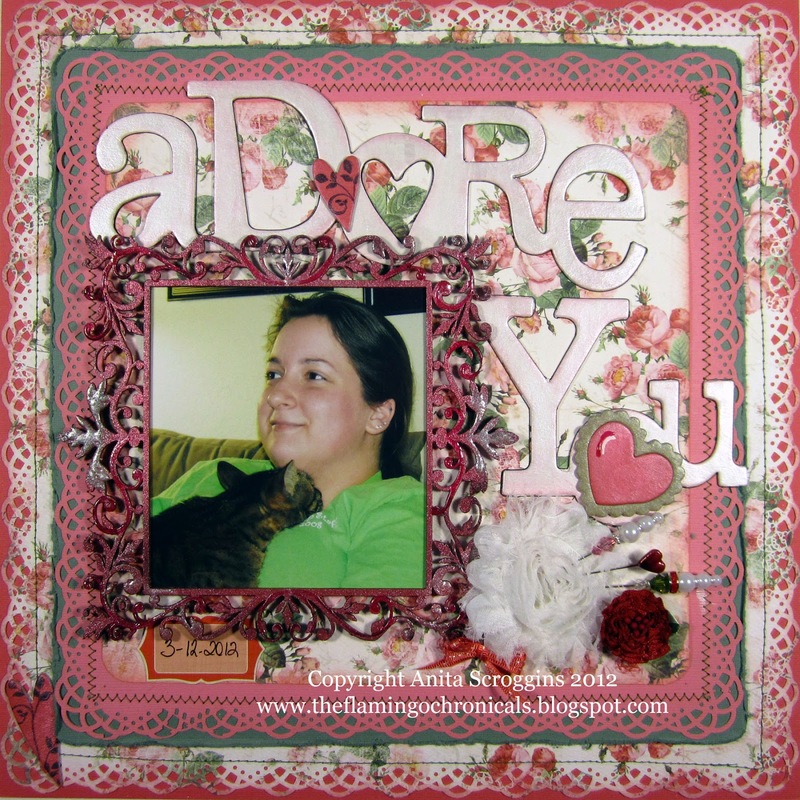 Here is a closer look at the chipboard frame. I have been hoarding this piece for a while, but I finally broke down and used it. I love this piece and I may have to go buy another one! The journal spot is October Afternoon. 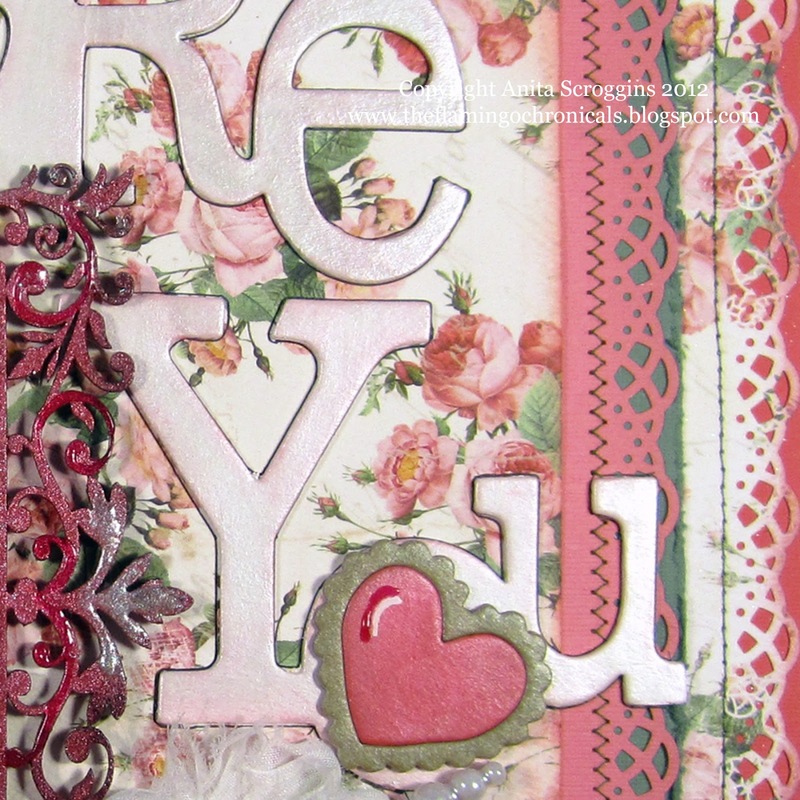 say hello - the best scrapbook store around I am tellin' you. 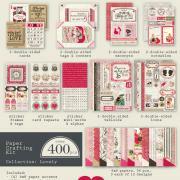 This is an 8 hour workshop and we will be using the fabulous new papers from Graphic 45. You will complete 26 pages during the workshop! 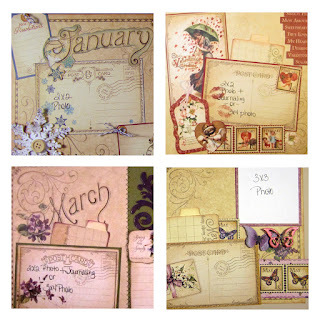 You will leave with 12 two page 8X8 layouts, 1 for each month along with a cover page and a back page. The album and lunch is included. Anita Houston! Join us in welcoming Anita to the Crafty Scrapper Design Team. I had the pleasure of getting to know Anita at RangerU last year and feel in love with her work, her passion of the industry and her bubble personality. 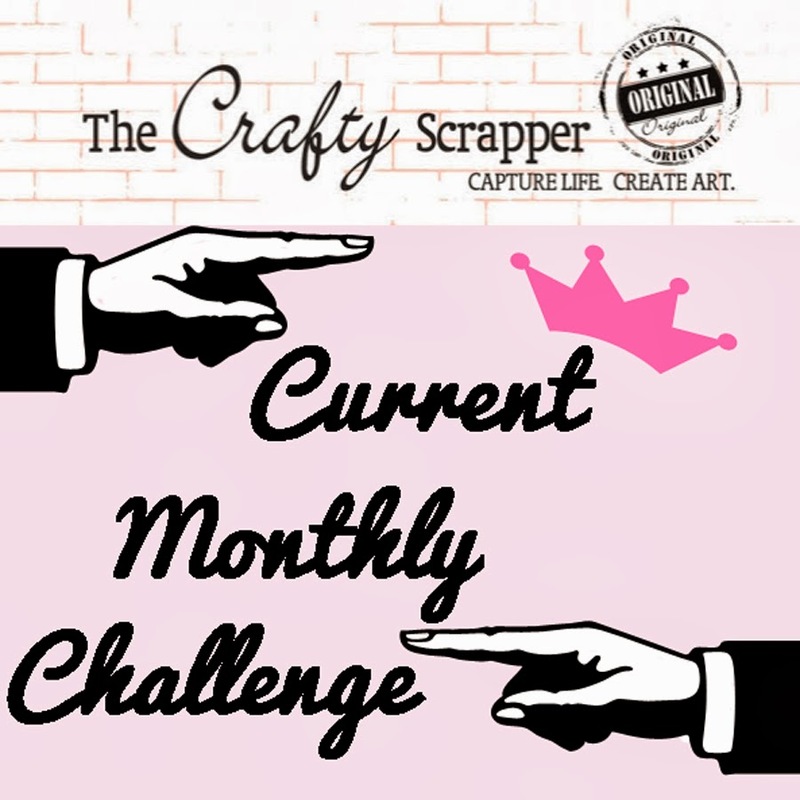 I probably live the furthest away being in Midland, Texas, but I would drive further if I had to in order to get My Crafty Scrapper fix! It's a fabulous store, and I am thrilled to be on the Design Team here. Thank you Carolyn! 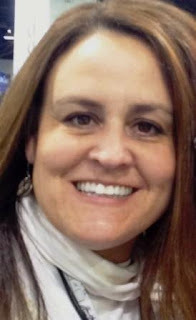 I was raised in the mountains of New Mexico, but I've also lived in El Paso, Morton (West Texas) and San Antonio before settling down in Midland, after my husband, Rick, graduated Law School. We were married right after I graduated collage from Eastern New Mexico University in Portales in 1993, with a degree in Education. I taught elementary school for 10 years, before quitting to help my husband run his businesses, as well as spend more time with our family. We have three crazy, smart, and gorgeous children, who pretty much run our lives, ages 16, 13, and 10. I've been interested in creating things ever since I can remember. The wonderful and vivid memory of my first box of 48 Crayola Crayons still resonates within me whenever I see a box. Pure euphoria of the box of 96 (With the ultra cool sharpener!) a few years later, was the highlight of my 6th grade year! I took every craft oriented style class I could in Junior High and High School...from Wood Shop to Leather Tooling to Welding. Cooking, baking, and crafting with my talented Mother was a way of life for me, and we participated in Craft Shows from my Junior High years and on. 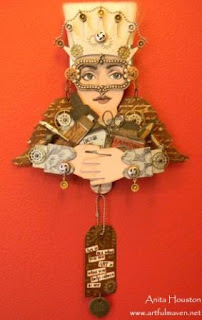 We made and sold so many things for extra income, and I adopted that philosophy all through collage as well. I even took in a Jewelry Making class, and sold my wares. If Basket Weaving would have been offered I would have taken it too. I'm thankful I have the opportunity to pass my love for cooking, baking, and crafting to my daughter, who also likes to create with me. While I don't sell much anymore, but hope to again soon, I am good at hoarding all things crafty. I really have a problem getting rid of potential elements for Art. I dabble in so many genres, and enjoy it all immensely, and especially love to teach what I know in person or on my blog. 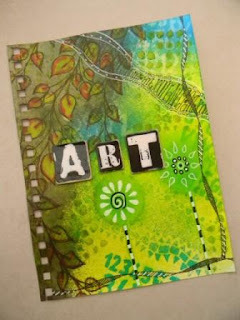 You can see my work, tutorials, and video tutorials on my blog The Artful Maven Haven at www.artfulmaven.net . The Hood at Christmas Time! Here are a few more of Anita's projects, be looking for her work in the store we are so excited to have her join us! I am going to leave you with this amazing canvas Anita made for her husband. Be sure and go HERE for close-ups and details on this amazing piece! Send you address to carolyn@thecraftyscrapper.com and we will mail out your prize. Thank you to everyone for the wonderful comments. The Lovely Sonia, Crafty Scrapper DT Member, is featured today on the blog. One thing I love about Sonia and I feel makes her pieces so unique, is she pours her heart and soul in her work. There is always a story and you feel it, and you get to know Sonia a little bit more. 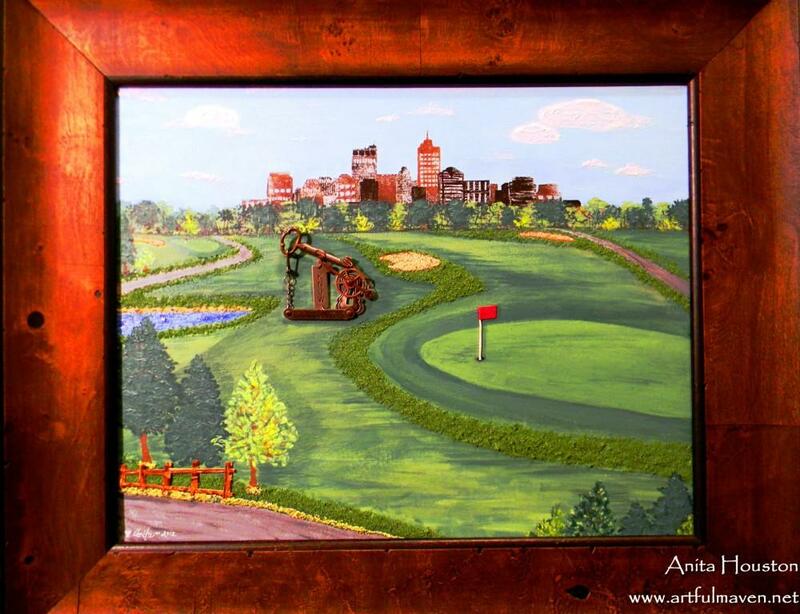 Thank you Sonia for this amazing piece and story! We are also doing a Valentines giveaway, we will be giving this Lovely kit away from Authentique. We will pick a winner this Friday, to win you must be a registered follower on our blog. How do you interpret this piece?? Valentine's Day --overpriced dinners, overpriced chocolates, overpriced flowers, overpriced champagne...what's not to love about it?! I think the best part of VD is making actual Valentine's Day cards and gifts for friends/loved ones. As you know by now, I like to explore my emotions and pour them into my work. So when I received a box of goodies from The Crafty Scrapper for my next Design Team project, I knew exactly what I wanted to convey. You see, love is a beautiful and a torturous thing. It's simple, it's complicated, it's raw, it's tender, it's magical, it stings, it heals and it wounds. Love is a whole lot of things. Ultimately, we are all love, aren't we? But what about the love for another human being? Does it get anymore scary and complex and exhilarating than that? Some days you feel like you have conquered and on others you are downright defeated. I like to linger in between, loving fiercely, never missing an opportunity to tell someone how they impact me whether it's good or bad --although the bad isn't typically well received. They say that some things are better left unsaid. 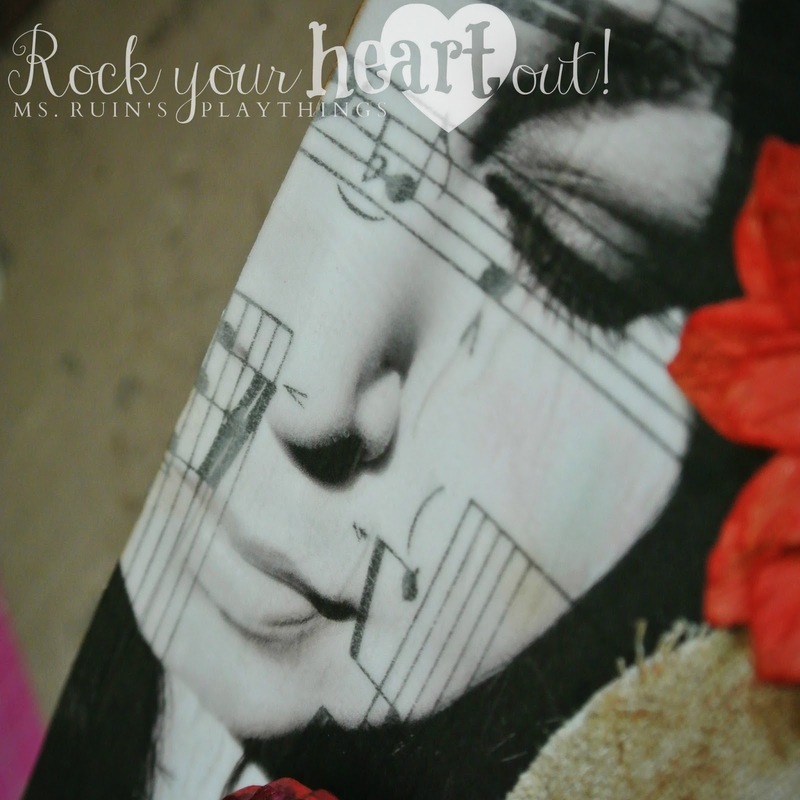 I tried that for a while but this girl wears her heart on her sleeve! "Shaken by the violence to exist only for you..." That's my message in my latest Design Team project. It was inspired by one of my favorite artists but I won't mention who because then you will figure this whole thing out and that's no fun. It's my belief that there is no one right answer to deciphering art. It's all perspective. I want you to see what you want to see, I want your heart to feel what it feels without hesitation. A lot of times I will just spell things out for people and tell them exactly what I was trying to accomplish in my project while leaving little to virtually no room at all for them to further dissect it. But here we are "shaken by the violence to exist only for you..." Could it be that someone is so tortured in loving someone else, that they are kicking and screaming and fighting the good fight to hold on to something unhealthy, something beautiful, something traumatic, yet something that completes them? Or does it make a statement about loving someone so deeply --"look at me, I would rip my heart out for you and bleed for you and die for you...because I love you THAT much!" Hmmmm...it is what you want it to be. What it means to me is a secret. Shhhhh. I'll just leave you guessing. 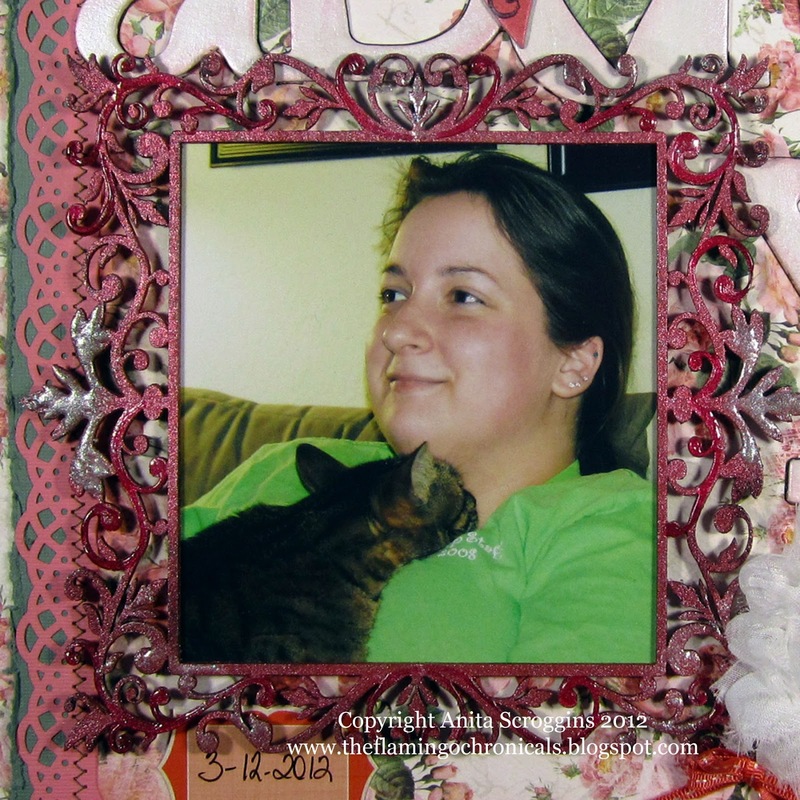 So here is my 6x6 canvas...on display now at The Crafty Scrapper in Waxahachie, Texas! I wrapped the entire canvas in "Composer" tissue wrap. I really wish I had grunged it up with distress inks and crackle before piecing it all together, but I didn't think about that till it was all done. It was just "too white" for my liking. About this lovely heart, which I consider to be the focal point of the canvas: I used a scalloped heart shaped tin by Maya Road and pressed red polymer clay into it. I then popped it in the oven and baked it for about 15 minutes. 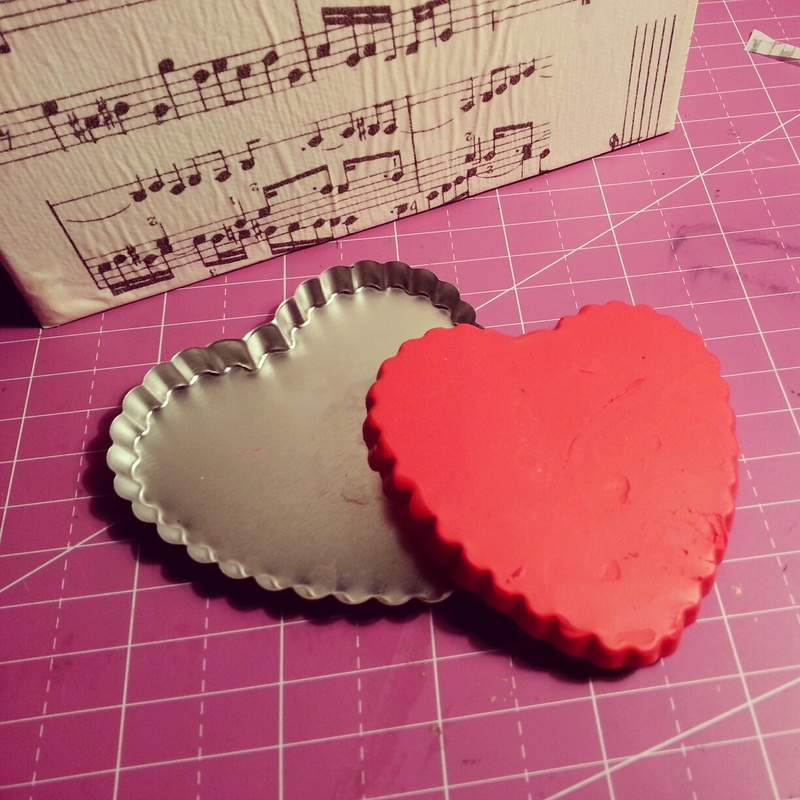 The very first photo at the start of this post illustrates what the tin and the heart looks like just out of the oven. I then used alcohol ink from Ranger to give it that deep blood red look. I think I used the color Raisin which is actually more of a purple tone. My next step was taking wire that I found in my husband's tool box and I just wrapped it around the heart with no rhyme or reason. Then I added the wind-up piece which is from the Tim Holtz Ideaology line. I had to rig it a little with a tootpick because the anchor wasn't long enough to fit all the way through the heart. But I was determined to make it work! 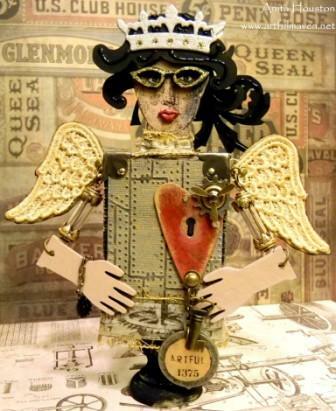 About the doll: The doll is by the lovely Lisa Pace. I just adore her and she is always so encouraging with me. She made a lot of doll pieces and they are all white. Again I used alcohol inks...Butterscotch and Gold, primarily. Then I cut the heart off of a Maya Road pin and glued it to the doll. 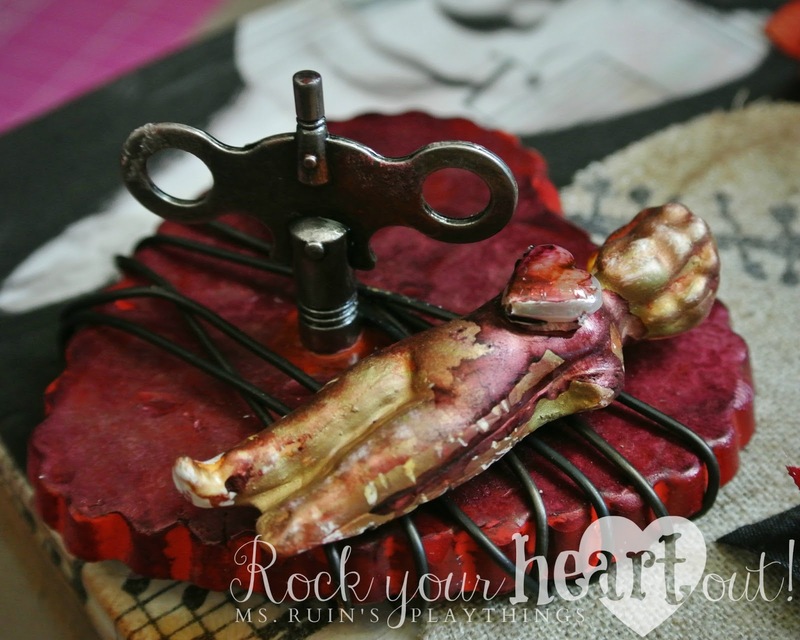 Then I let Raisin alcohol ink drip directly over the heart. ::exhale:: What a powerful piece. This heart alone is a piece of art. Just look at all of the symbolism. Wind me up, imprison me, break my heart, prisoner of your love...so many ways to interpret. How do you interpret this piece?? The first question out of everyone's mouth was "How did you transfer your photo onto the canvas?" Well, I didn't. I printed my photo on a piece of vellum paper. I then used a thin layer of Diamond Glaze to adhere it right onto the tissue. I actually mounted the tissue on cardstock AND THEN adhered the vellum to it and then I stuck in the fattest book I could find and maybe I also stood on top of the book. I wanted the tightest seal possible. It worked out pretty awesome! 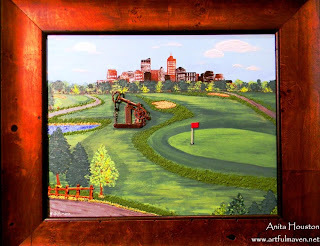 I hope you enjoyed this piece --I have already started working on the next one in my head! Eeeeeeek! So much fun. Well, I did this card for the Design Team at The Crafty Scrapper. I will be the first to say I just do not do cards well. But here is the one that I created. I used Pink Cardstock for the card. 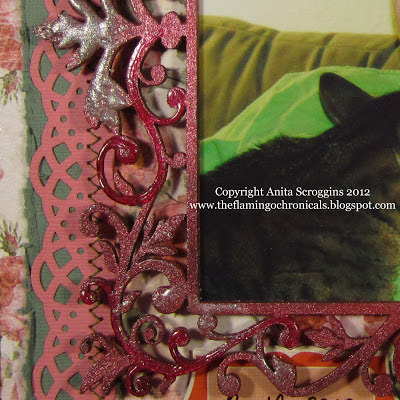 I cut out using Martha Stewart Double Loop Punch and then I used stickles on the cut out part. I had a doiley in the shape of a heart and then cut out from the pink cardstock a heart to fit inside the doiley. 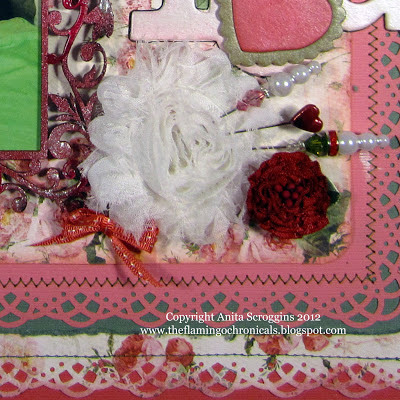 I used lots of Prima flowers plus white ribbon. I added some left over Kiss Me ribbon to the bottom of the card. Thank you for peeking and please visit The Crafty Scrapper! 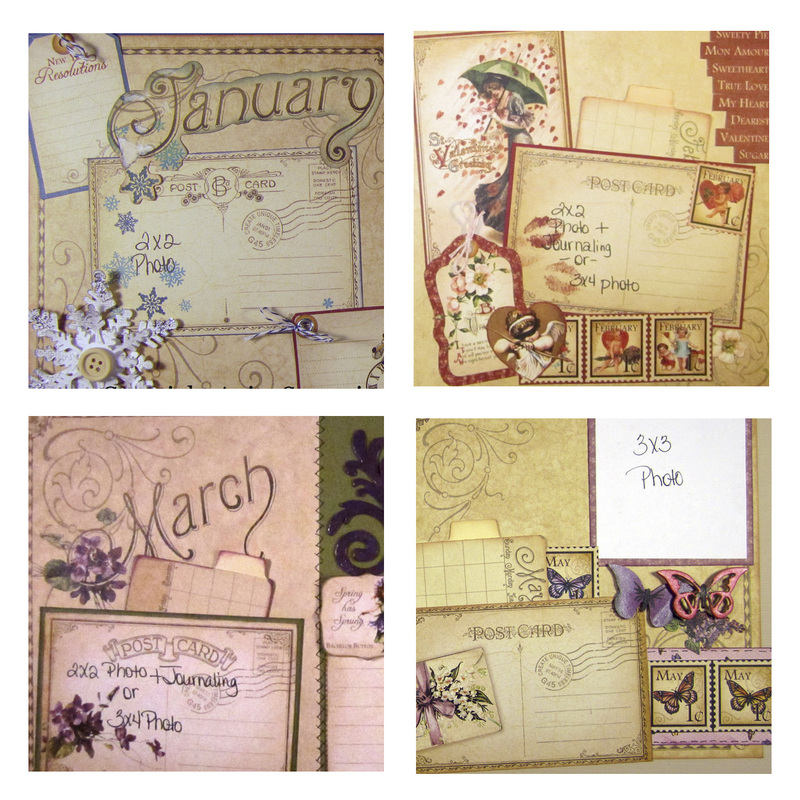 from Stampers Anonymous have arrived at the store! We had a great time at CHA! We had a little snag coming home... they cancelled our flight! Fortunately, Carolyn was able to call and get us on a flight just a little later in the day. Be sure to watch our facebook and the blog for updates. We will post as new product arrives. Today was another busy day! 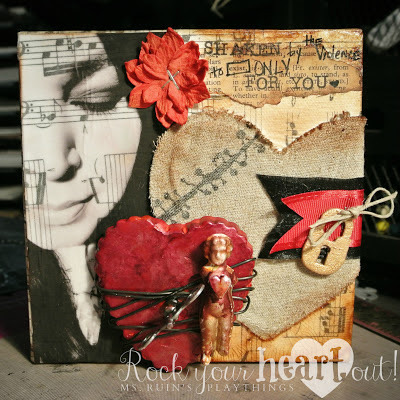 We found some awesome new tools and saw more of our Crafty Scrapper friends! Our first stop was at the We R Memory Keepers booth... We checked out the new envelope maker. Very, very cool! It has been a a major hit at the show.. our's should arrive in April. Another cool storage idea we found was the washi tape dispenser and those are shipping now. Ok, stampers... 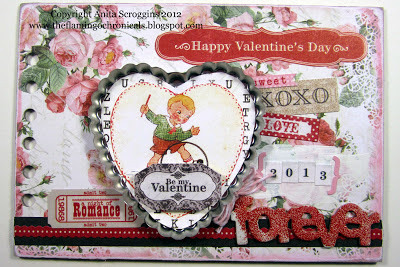 I was able to sneak away from Carolyn and I found some stamps! OH, and I ordered almost ALL of them... just don't tell her! I ordered several Saturated Canary designs exclusive to rubber stamps. They are AWESOME!! We went by the Glue Arts booth and what did we see? 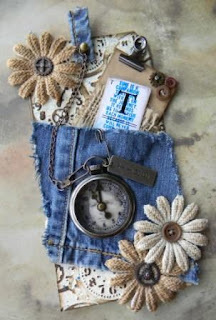 An AMAZING project created by our own Anita Scoggins!! We ordered Dina's new book and it will be arriving at the store in the next couple of weeks. She has also booked a weekend to come and do classes! Mark you calendar for June 15th and 16th! Hey guys! We have the blog up and running again! Did you miss us? We had an exciting first day on the CHA floor. Some of our stops included... Sizzix, Graphic 45, Little Yellow Bicycle, Melissa Frances, 7 gypsies, Impression Obsession, Maya Road, Ranger, Advantus, Splash of Color, BoBunny, Simple Stories, Crafters Workshop and then we had lunch! No, no just kidding, but we did place orders with all those companies today. We ran into one of our favorite friends.... THE GENTLEMAN CRAFTER!! We have seen so many wonderful samples. The talent in this industry is overwhelming! This is one of the layouts from the Ranger booth. 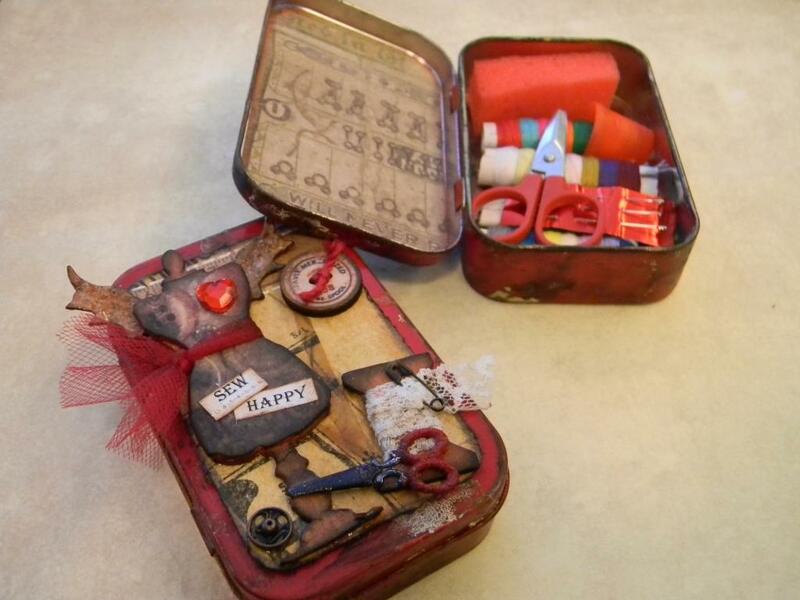 It features the new Distress Paints by Tim Holtz and several of his new dies. Our day ended spending some time with our old friend Angela Peardon, one of the Maya Road design team members, and her friends all the way from Australia! They were delightful! Tomorrow I will continue to help Carolyn spend some MORE money! Our first stop will be to the We R Memory Keepers booth where we will check out the new envelope maker!